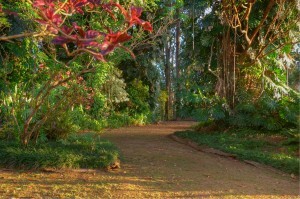 Sunset Ranch has dedicated a large portion of the property to botanical gardens. We have a wide variety of native and non-native flora and fauna all around the property. Sunset Ranch is also continuing to work on plans for an interactive nursery on-site. The nursery will be located on the southeast portion of the property. The primary objectives of the nursery at Sunset Ranch are to: (i) establish a satellite nursery for native Hawaiian flora and fauna in partnership with Hi’ipaka; (ii) educate the local community and other visitors on native versus non-native plants, and (iii) establish a staging area at Sunset Ranch to conduct local hikes into the mauka regions of the valley in an effort to maintain invasive species and to reintroduce native species, where appropriate and able. Hi’ipaka is the owner and operator of Waimea Valley. 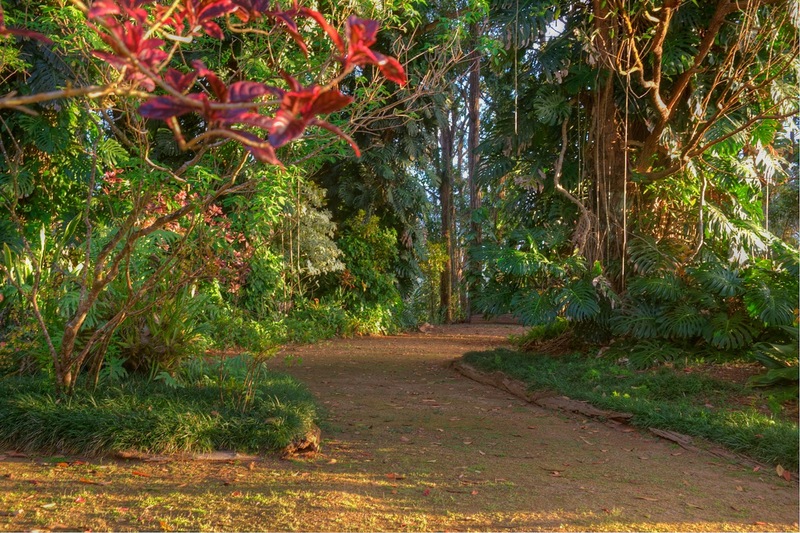 Waimea Valley is an 1875 acre sacred Hawaiian preserve that is located just south of Sunset Ranch and home to over 5000 tropical and subtropical plants. Sunset Ranch and Hi’ipaka see two primary reasons for a strategic partnership: (i) a satellite nursery at Sunset Ranch provides a facility away from the threat of landslides in the valley, and (ii) the higher elevation at Sunset Ranch provides for a more productive nursery for certain native Hawaiian species. Sunset Ranch is excited about this partnership, and committed to the benefits this site will bring to Waimea Valley and the community. Sunset Ranch is excited about using the nursery as a tool to educate the community on native versus non-native plants, and the importance of land conservation and self-sustainability in Hawaii. The design of the nursery will be interactive in nature and allow children, students, families and visitors to see native plants up close. Visitors will also be able to learn about invasive species and the history of the surrounding area. Sunset Ranch is also interested in establishing the nursery as a staging area to lead community efforts to maintain invasive species and reintroduce native species, where appropriate and able. Our vision is for visitors to educate themselves on native versus non-native plants, and then take their newly acquired knowledge into the valley. We also hope to work with schools and organizations such as the Boy Scouts to organize these efforts into meaningful and effective programs. We truly believe that the Nursery at Sunset Ranch can be a meaningful tool to advance the causes of land conservation and self-sustainability on the North Shore of Oahu. If you’re interested in our Nursery efforts at Sunset Ranch, or you have any thoughts or feedback, please feel free to contact us through our Contact tab, or call us at (808) 638-8333. Mahalo! 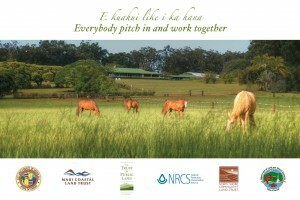 So how can you learn more about land conservation in Hawaii? And how can you get involved? 1. The NSCLT holds ‘talk story’ events to get the word out and explain not only their efforts, but various land conservation programs available to the community and to land owners. We highly recommend that you get in touch with the NSCLT and inquire about their next ‘ talk story’ event. Not only will it be informative, it will get you excited about land conservation in Hawaii. 2. The NSCLT is currently developing a thoughtful strategy to prioritize land conservation efforts on the North Shore through their “Greenprinting Project”. Given the amount of land that is currently for sale on the North Shore (through Dole, Continental Pacific and others), it is important to understand the significance of this project. The NSCLT has a new fundraising campaign called “7 FOR 7” that will assist with raising money for this effort. Check out the “7 FOR 7” video on our drop down menu on the Event page. 3. For additional information, or if you want to get actively involved with land conservation on the North Shore of Oahu, contact Sunset Ranch at (808)638-8333 or NSCLT at (808)638-0338. We also suggest you visit the NSCLT’s web-site at www.northshoreland.org to learn more. 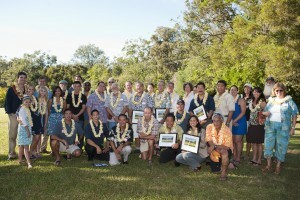 So please get involved with the important cause that is land conservation in Hawaii. While monetary donations to the NSCLT are great (you can now easily donate via Crowdrise here); we also encourage you to donate your time. There are many ways to get involved, and the time to get involved is now. Mahalo! Please join us on Sunday, November 21st from 2 pm to 6 pm to celebrate the perpetual protection of Sunset Ranch, and one of the first private conservation easements in Hawaii. This event is an Open House! There will be pupus, entertainment and tours around the property. It will be a very special day. We hope to see you there! I also wanted to share a few critical points of mention with regard to the benefits that come along with private conservation easements. 3. The property remains a revenue source for the City & County. Again, the land owner continues to hold title to the underlying land and therefore continues to be reponsible for property taxes assessed by the City & County. Alternatively, under a public conservation easement, oftentimes the State or City & County takes ownership of the land and the property tax revenue source is completely lost. This is a significant amount of revenue! When you consider this pont along with the two previous points, the value of private conservation easements becomes quite clear. Our mission at Sunset Ranch is to establish the property as a platform to help advance land conservation and self-sustainability in Hawaii. In order to effectively do this, we need to start by helping educate the community on the programs that exist and are available to landowners. With regard to land conservation, when you consider the amount of land that is currently for sale by Dole and others on the North Shore or Oahu, it is very clear that the time is now to help advance the cause.